The primate of The Church of the Lord, Aladura, Worldwide, an African initiated church founded in 1925 talks with pride about how the founder had a calling from God to have women serving with men in pastoral work. Primate Rev. Rufus Okikiolaolu Ositelu, metropolitan archbishop of the church visited Geneva and the World Council of Churches on Jan. 29-30. He spelled out some of the ecumenical, inter-faith and developmental work of the Church of the Lord, which joined the WCC in 1975 in an interview with the WCC. "According to the founder, he said God told him to have both males and females in the pastoral work and the church. Since, then it has been growing in multiples," said Ositelupointing to how the church was a pathfinder in both the global and African context. He is the son of the church founder, Josiah Olunowo Ositelu. He noted that now the church is thriving all over West Africa: in Liberia, Sierra Leone and of course Nigeria with women serving at all levels in the church. "The church is the first African church to be established on European soil and that was back in April 1964. The church is also thriving in the United States of America, so that is where the name worldwide came from. We are in Australia too." He lists the six tenets of The Church of the Lord, Aladura, which in Nigeria's southwestern Nigeria Yoruba language means "owners of prayer", "Prayer Fellowship" or "The Praying People". "We are: ecumenical in outlook; Pentecostal in power; biblical in pattern; social in responsibility; evangelical in vision and prophetic in ministry." The church has 3.6 million members and joined the WCC in 1975 with the visit of the delegation taking place as part of the celebration of the WCC's 70 years as a living fellowship. The Church of the Lord is also a member of the Organization of African Instituted Churches; All Africa Conference of Churches (AACC); Christian Association of Nigeria, a broadly ecumenical group that includes traditional Protestant churches, the Roman Catholic Church and Pentecostal churches; and the Christian Council of Nigeria that includes traditional Protestant churches and is part of the WCC. "I am the vice-president of the Christian Council of Nigeria, so the church is also playing its role," said Ositelu. Then there is in the multi-faith dimension, as the primate said, "We are very passionate about peaceful coexistence. If we get to know one another there will be no problems." The primate comes from Africa's most populous nation of 190 million people where Christianity and Muslim are the two dominant religions, but he said he also comes from where African traditional religions are also strong. "We have just inaugurated an NGO (non-governmental organization) ...to work with Muslims and African traditional religions, a mission on peace," said Ositelu. He observed that people say there is a problem between Muslims and Christians in Nigeria who some say balance each other out numerically. "The answer to that problem is right here in Nigeria because in the southwest of Nigeria, Christians and Muslims are living together peacefully." Ositelu notes that some people in the north where Islam dominates believe that Muslims in the south "are pagans". Educating Nigerians is a key to solving many of Nigeria's problems but there needs to be teaching so that people can move forward with their lives and not merely religious instruction at schools. "Every one of us cannot be a pastor. Every one of us cannot be an imam. We need people who are going be doctors, nurses, teachers, engineers and so on," said the primate. And when it comes to working towards the United Nations Sustainable Development Goals, "the church generally believes that they can play a role in this area...Many churches in Nigeria have vocational institutes where they train people in trades." He cited a medical centre run by The Church of the Lord in which the first woman who gave birth there was a Muslim; "because our role is to take care of humanity." Ositelu also mentioned the inter-faith centre in Kaduna in northern Nigeria where Christians and Muslims have committed to work together for peace. He said it needs Islamic partners to fill the places set aside for them in the equal venture. "I am optimistic about ecumenical and interfaith work in Nigeria," said the primate, who attended his first WCC Assembly in Harare in 1998. He said, however, it seems strange that sometimes Christian groups who don't talk to each other at home will meet when they attend regional and global ecumenical meetings. "Through the AACC and WCC we started talking," said Ositelu. "I was wondering if we talk in Geneva, why can't we talk at home? 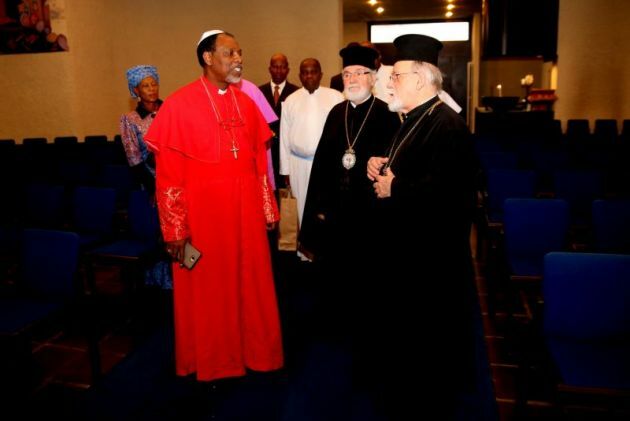 Regional and global ecumenical bodies are helping national churches to talk together."